The exact origin and purpose of this manuscript is uncertain. It was begun in the 13th century, and added to in the 14th and 15th centuries. Most of its contents relate in some way to Ely Priory--many of them relating to a variety of private and public devotions--so it was presumably handed down from one Priory official to another. It appears to be a prayerbook, assembled for personal devotion. These two columns of names form part of the litany which would be read to invoke the aid of God and the saints. 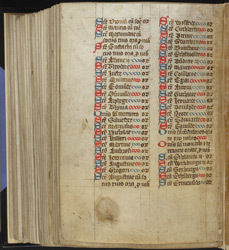 Saints especially venerated at Ely are to be invoked twice each, as indicated by a 'ii' after their names: Alban (1st column, line 7), Benedict (column 2, line 7), and Etheldreda (column 2, line 5 from the bottom). Alban's and Etheldreda's relics were at Ely, which was a Benedictine foundation.